Eleotin® comes in many different blends and formulas for addressing metabolism. Currently, Eleotin® is available in Eleotin® Bentley, Eleotin® Gold Capsule, and Eleotin® Mb. There are also numerous other items of the Eleotin® brand that address concerns related to metabolism such as detoxification, brain health, and hypertension. To learn more, click here. The most popular product is Eleotin® Gold. Each different blend has a beneficial function. These are described in the sections below. All the formulas are available in a traditional herbal tea form, while a few formulas are available in a more convenient capsule form. This should be taken before big meals because it helps maintain healthy blood sugar levels after a meal. Diabetes patients usually experience a sudden peak in the blood glucose levels after meals. This is called Post-Prandial Peak. It is damaging to many parts of the patient’s body. Blend A works by increasing insulin production from the pancreas and delaying the breakdown of carbohydrates into glucose. Therefore, this Post-Prandial Peak virtually disappears. While other blends of Eleotin® are for long term purposes, this blend is for short term defense with smaller long term effects. Blend A is also a good source of natural fiber and contains substances that help digestion. Remember, Blend A helps to gently control blood sugar in a healthy and natural way without any side effects. In contrast, most herbal products and most sulfonylurea drugs attempt to control blood glucose artificially. When Eleotin® is used insulin is shown to secrete only when it is most needed. Other blood glucose control products do not seem to have this self-regulating, self-timing mechanism. As a result, hypoglycemia occurs more often than not. This should be taken on an empty stomach. Blend B improves the health of insulin receptors so that glucose is more efficiently absorbed into muscle or liver cells. This reduces blood glucose levels and allows cells to properly burn this energy. In other words, Blend B creates a beneficial effect on the muscles of patients, like that of a pumping iron. The muscles become more efficient burners of blood glucose. Blend B cleanses the blood system through diuresis. This assists many areas of the body, especially the function of kidneys. Many kidney disease patients reported improved kidney function after 3 to 6 months of using Blend B. Testimonies of less frequent dialysis were also reported. This is only logical since the kidneys are made of tiny capillaries and act as the body’s blood filtration system made of tiny capillaries. High blood glucose in the blood stream creates a burden on these tiny capillaries. Imagine what would happen when you try to push honey though a tiny sipping straw. Once or twice is fine, but if you try this 24/7, it is only a matter of time before this sipping straw bursts. It is no wonder why so many diabetes patients have kidney problems. That is why Eleotin® is good for those with kidney problems. When blood sugar is reduced, so is the strain on the kidneys. But unlike other diuretic agents, Eleotin® is shown to induce no “too low” blood pressures. Diuresis induced by Eleotin® is known to be natural and safe even for those people with difficulties in maintaining healthy blood pressure, which often happens to be those people who have diabetes. The medical evidence of a few patients shows their immune systems were boosted after the using Eleotin®. These benefits can be mainly attributed to Blend B. This why so many people take this blend for general health purposes. A U.S. distributor of Eleotin® has also indicated that there are a number of cancer patients who use Eleotin® products for a boost to the immune system. Another aspect which deserves to be mentioned is that people usually have many unhealthy substances such as fat and dead cells in their blood system (other than just too much sugar). These in turn cause many complications. Blend B cleanses the blood system of many of these unhealthy substances. As this cleansing process happens, people feel much stronger and full of energy. This blend is mainly attributable for remarkable improvements of those diabetic gangrene cases. Should be taken before bedtime. Blend C provides essential nutrients that strengthen the pancreas. Also, this blend provides other nutrients that are often lacking due to the nutritional imbalances experienced by many diabetics. The jujube, a certain Tibetan species, used in this blend is known to contain a rich sugar. But this sugar bypasses the normal digestion/blood glucose raising process. Therefore, this sugar is known to provide needed energy and nutrients to the cells without raising the blood glucose levels. This is a new finding in western medicine. But it has been known in TCM for thousands of years. The rich nutrients in Blend C result in long term benefits. The lack of these essential nutrients has been known to permanently damage various part of a person’s body. Also, these nutrients help the individual to sleep better by providing analgesic (pain killing) help to those aching and tingling nerve senses all over the body. This is especially important to individuals who have serious neuropathy (nerve damage). There are definitely no safety concerns with mixing all three blends together taking them at the same time. The mixed blend will still have beneficial effects, but will work slower. If you find that taking all three blends at different times causes too much inconvenience, feel free to mix them. Please take this new blend the same number of times per day. Taking a mixed blend when you are pressed for time is better than skipping or temporarily stopping your Eleotin® consumption due. But with the capsule form, the blends are clearly marked with different colours, leaving the chance of being mixed up very small. Also, taking a capsule is far more convenient than making and drinking a herbal tea. Eleotin® Gold Capsule was developed as a simple alternative and a more convenient form of the Eleotin® Gold Tea form. It is the equivalent to the tea form. This product is not available in all countries due to the differences in regulations. One unit of the capsule form comes in three different bottles: Morning, Afternoon, and Night. One unit is intended to last for one month, with one capsule from each bottle every day, or 3 capsules a day. This capsule form lasts for 30 days, whereas the tea form can last for about 60 days. What is Eleotin® Mb Tea? Eleotin® Mb Tea is a special herbal blend developed for general health improvement and weight control. The difference between Eleotin® Mb and other weight control products is a lengthy discussion. 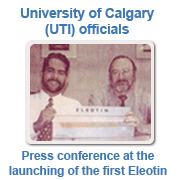 You can find more detailed information on the internet or more specifically at www.eleotin.ca.